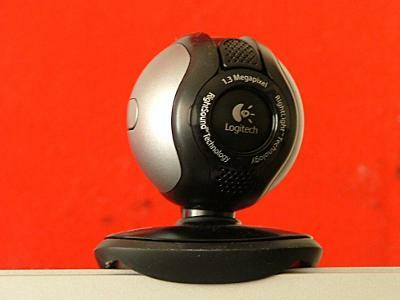 Having never tried using a webcam with Ubuntu, I recently picked up a Logitech Quickcam S 5500 – more specifically, the ‘for business’ model. As far as I can tell, the ‘for business’ version denotes the package rather than any difference in the camera itself. The package was a minimalistically small box with the camera, a compact disk and a manual tucked inside. The exterior motif was simple, just a picture of the camera, a ‘certified for Vista’ logo and a product code panel. This is the sort of packaging that really makes sense, the box is no bigger than it needs to be and doesn’t waste materials which will ultimately be disposed of. 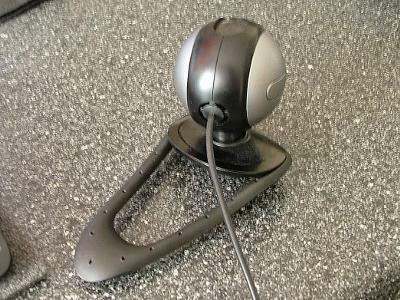 The included software (this may be the distinction of the ‘for business’ moniker) is Logitech’s Quickcam for Enterprise on a CD. Presumably, the consumer oriented version of the S 5500 package would come with different software. Unfortunately, from the point of a review, I left the software in the box untested as I would be connecting this camera to a Ubuntu 8.10 system with which the software would be incompatible. The camera itself is just a bit bigger than a golf-ball with a ‘poseable’ foot/mount and a slide-down lens cover. The sensor is a true 1.3 megapixel unit having a native resolution of 1280×1024 pixels. The USB lead which conveys both video and microphone audio from the camera is about 2 meters long and comes with a thoughful tag near the USB connector which identifies the device to make it easy to find it when unplugging it from a USB hub. Bus 001 Device 004: ID 046d:09a1 Logitech, Inc. The two ‘hub’ entries are also apparently generated by the camera. If found the camera to be working quite literally ”out of the box’ with xawtv. 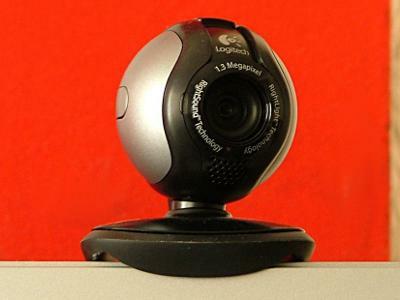 The camera complies with the “USB Video Class” webcam standard and is already supported by the Linux UVC drivers. Sadly, the included luvcview application which allows finer control of the cameras features wasn’t working with the S5500 so I ended up pulling the trunk sources from their git repository and building them myself. This got luvcview working and allowed manual control of the cameras exposure settings. Logitech includes what they call “Rightlight Technology” with this camera. Put simply, the camera varies it’s exposure duration automatically depending on the available light. For instance in broad daylight, the camera will perform at 30fps. With only the light of the computer monitor on my face in a darkened room, the camera will continue to produce a good quality image at a much lower frame rate (typically 5fps). When changing the exposure manually, you are directly changing the frame rate. The sensor still captures a suprising amount of detail when deliberately set to underexpose. The field of view is reasonably wide although not excessively so. You could confortably sit two people at a reasonable distance from the screen in front of the camera and have them in frame. The picture is generally quite sharp and well focused – the lens appears to be fixed focus – but there are some minor abberations at the edge of the image presumably caused by the size and type of lens in use. It’s still an extremely good quality image for a webcam. Again, in the true tradition of being the most annoyingly lax reviewer ever, I neglected to test the integrated microphone which appears to sit just below the lens. The bezel touts “Rightsound Technology” so perhaps this microphone provides automatical level seeking. There is also a button on the left side of the camera which would provide call activation/cancellation features in some Windows software but doesn’t have a default purpose on most Linux based software. From the end user perspective, it’s ever so slightly early days for UVC cameras on Linux. Ubuntu 8.10, while supporting the Logitech S5500 has some shortcomings. For instance, Ekiga, the packaged software videophone doesn’t support UVC cameras in the shipped version. I reckon it’ll all be pretty much plug-and-play by the time Ubuntu 9.04 comes around in April though. The latest versions of Ekiga which will be packaged with Jaunty Jackelope already supports UVC. Finally, the packaging reduced ‘for business’ version of this camera that I bought was actually a bit cheaper than the consumer counterpart. 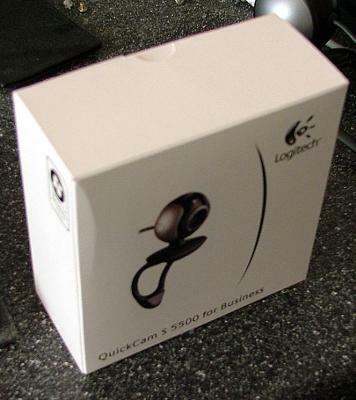 This entry was posted in Hardware and tagged 8.10, for business, logitech, luvc, quickcam, s5500, ubuntu, uvc, webcam by ninjaneer. Bookmark the permalink. Sadly, the included luvcview application which allows finer control of the cameras features wasn’t working with the S5500 so I ended up pulling the trunk sources from their git repository and building them myself. This got luvcview working and allowed manual control of the cameras exposure settings. Can you explain how to do this, step by step, in easy to follow language? You need the Mercurial package so sudo apt-get install mercurial should get you that. Then in a convenient directory, you can use hg clone http://linuxtv.org/hg/~pinchartl/uvcvideo/ which is the checkout command for mercurial. cd into the uvcvideo directory and issue make all then if everything actually builds correctly, issue sudo make install. It’s a bit of a cheat doing it this way as you’re actually building the whole uvcvideo driver set too. I think I had the kernel sources installed first as well. If you can’t build it yourself, you should find better support for the S 5500 in Ubuntu 9.04 in three months or so time. Have you tried this cam with skype ? If so, does it work out-of-the box with skype ? This is really good information. I really wish that more peoele were interested in this topic. It is disappointing because of the value.